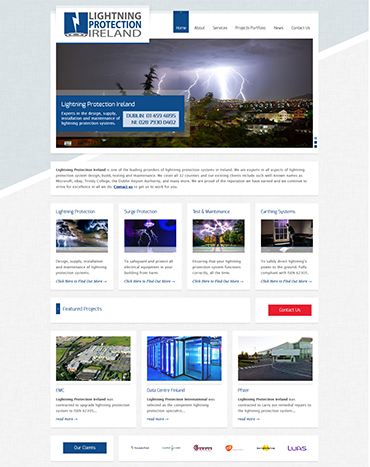 In just three years since foundation, Lightning Protection Ireland has become one of Ireland’s leading lightning protection systems providers. Clients include such well-known names as Microsoft, eBay, Dublin Airport Authority, and Trinity College Dublin. A website we built at the time of the company’s launch in 2014 no longer fully portrayed their expertise and experience. In addition, the site did not match the corporate branding of the website we had built since then for their parent company, Select Roofing. They opted for a complete re-redesign – and we were happy to oblige. We reviewed the menu structure and pages content of the original website. We then drew up a plan for how both could be improved. The client liaised with us in terms of crafting new content. This would have to many technical terms and concepts in a manner that could be understood by non-engineering staff. We also gathered details and photographs of more than 20 projects already completed by the client. This was to allow us add a new portfolio section. Once all the content was good to go, we moved on to the website design and build. 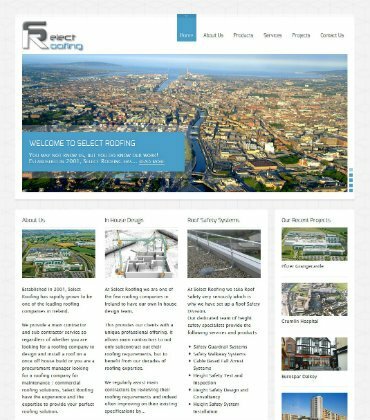 The client wanted us to base the design of this site on the website of Select Roofing, the parent company of Lightning Protection Ireland. This made the build relatively straightforward. Both client and designer already had a definite vision of how the completed site should look. We build the front end of the site exactly as requested. We gave the back end all our trademark SEO attention as the build progressed too. This allowed the new site to hold its number one ranking on Google for search terms such as ‘lightning conductors Ireland’, ‘lightning rods Ireland’, and ‘lightning systems Ireland’. The client was happy with both the site and its rankings – and you can’t say better than that! We were commissioned to deliver a NEW Website Design for Select Roofing. Select Roofing based in Baldonnell, Dublin, who are Ireland’s leading Roofing Contractor Company, offering a wide range of roofing solutions, from design through to maintenance.